Most US acupuncturists treat patients on tables in individual cubicles. This is not traditional in Asia, where acupuncture usually occurs in a community setting. At Asheville Community Acupuncture, we treat patients in recliners in a quiet, soothing common room. Also, with this more traditional style, we spend less time talking and rely more on tongue and pulse diagnosis to decide how we will treat you. This allows us to see more patients in an hour so that we can keep prices down for you. The group setting has benefits beyond just affordability. As with any kind of intentional group endeavor—such as meditation or prayer, for example—when you do something with other people it raises the energy for everyone. 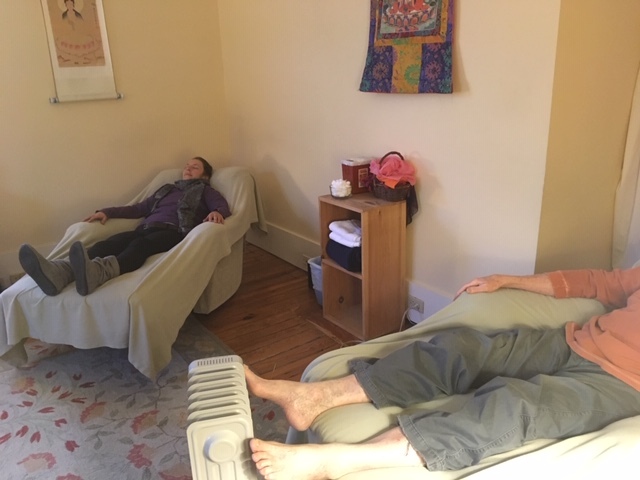 It’s the same with acupuncture: receiving treatment in a room with others raises the Qi dynamic and healing is enhanced. It’s also nice for friends and family to be able to come in together. Another difference is that we let you decide when you feel ‘done’ before removing the needles. The ‘right’ amount of time will vary from patient to patient, and may vary for you from visit to visit. (If we’re busy we may have to limit the time to one hour.) We feel this helps to empower you in your healing process by letting you listen to your body and have input in your treatment. Please wear loose comfortable clothing; we need to be able to access your elbows and knees. Tank tops and button down shirts are helpful too. Please refrain from wearing colognes or strong scents, as some of our patients have chemical sensitivity. Some of our patients fall asleep and snore; bring earplugs or headphones if you wish. Please take all personal belongings with you into the treatment room, and turn off your cell phone. The soothing atmosphere in the community room exists because our patients create it by relaxing together. To help us maintain this oasis of calm, we ask that you please speak in whispers and do not socialize with others while you’re in the room. Read more about community-style acupuncture in this article from Yes Magazine. The Community Acupuncture Network also provides information on community-style acupuncture treatments. Additionally, it has a clinic locator if you want to find a clinic like ours in another area.